The instant I managed to stop laughing, I knew I had to post this political cartoon from Mr. Payne. 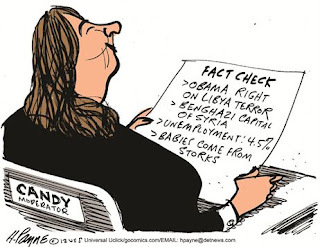 Before political ideology trumped journalistic integrity in the MSM, Candy Crowley would probably have been fired over her actions in the debate, but now the MSM just circles the wagons and the pseudo-journalists all protect each other. Rush Limbaugh was talking about it today. His example was what occurred with Dan Rather. Yes, he lost his job, but he was honored at a special awards dinner held for him by Brokaw et al and now he is honored like a Professor Emeritus. The MSM has absolutely no credibility left with anyone who halfway pays attention and prefers truth to political slant.